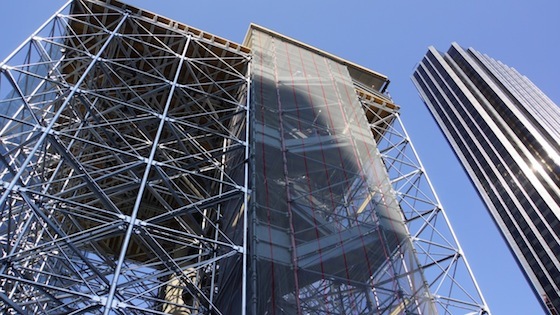 The scaffolding surrounding the statue of Christopher Columbus in the circle that bears his name doesn’t indicate that the 120-year-old statue is getting a facelift. No, Columbus has a temporary living room, courtesy of Public Art Fund and Japanese artist Tatzu Nishi. 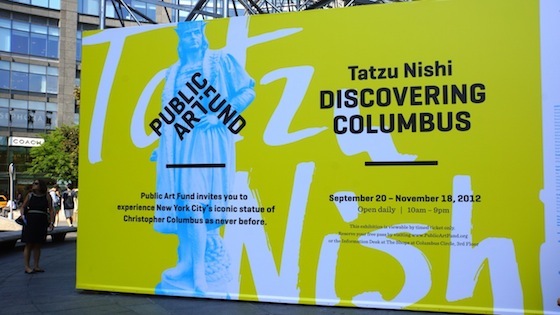 Tatzu Nishi Discovering Columbus is a free exhibition that brings the public into the explorer’s personal space. It opened on September 20 and runs from 10:00 a.m. until 9:00 p.m. daily until Sunday, November 18. For his first public project in the US, the Nagoya-born, Berlin-based Nishi places Columbus in a living room. Well, actually, he places the living room around Columbus, giving the 13-foot tall monument four walls, furniture, artwork, and even books. The large-scale works of Nishi seem a perfect fit for Public Art Fund, an organization that offers free exhibitions that bring together art and urban locales around New York City. While Tatzu Nishi Discovering Columbus is free, you’re not free to go in whenever you want. The process of viewing the exhibition is through timed tickets, which must be reserved either online at Public Art Fund’s website or at the Information Desk on the third floor of The Shops at Columbus Circle. 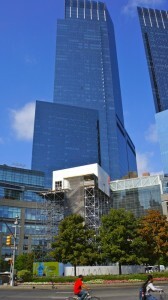 I’ve reserved my ticket for Monday, October 1, and I’m looking forward to climbing six stories of stairs to spend some time in Christopher Columbus’s penthouse 70 feet in the air.